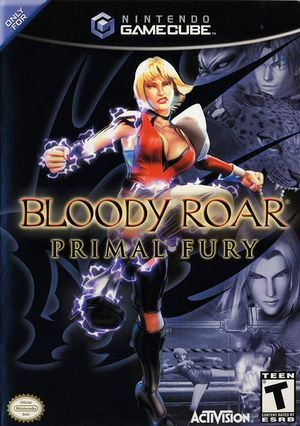 In Bloody Roar: Primal Fury, (Bloody Roar: Extreme in Japan) wage an all-out assault as one of 16 fighters, each with the ability to transform mid-fight into their alternate Hyper-beast life-form. Fight to the finish in 2-player head-to-head and single-player modes through 10 interactive and destructible multi-level arenas. With fast and furious arena action, fighting has never looked this good or been this brutal. Text in the Japanese release is messed up. Unclear, but can likely be resolved with revisions to Texture Cache Accuracy. Refer issue 10705. Videos in this title require XFB Real. Fixed with Hybrid XFB in 5.0-5874. To play properly in 16:9 and eliminate Object pop-in at the edges of the screen during gameplay, before booting the game, use one of the following codes.. The graph below charts the compatibility with Bloody Roar: Primal Fury since Dolphin's 2.0 release, listing revisions only where a compatibility change occurred. This page was last edited on 20 July 2018, at 05:11.